It’s no secret that Germany is one of the greyest places on the planet. Just take a look at this solar irradiance map and you will find out that Germany is located poorly in terms of solar radiation. But the dull sunlight does not seem to stop Germans from being world champions in solar energy production. In July, the mostly grey-skied country's solar panel electricity production rose above 5.1 TWh. That’s according to the latest data from the EEX Transparency Platform; a figure that outstrips the 5 TWh of electricity from wind turbines that the country logged in January (it’s also a wind power leader, in case you weren’t aware). 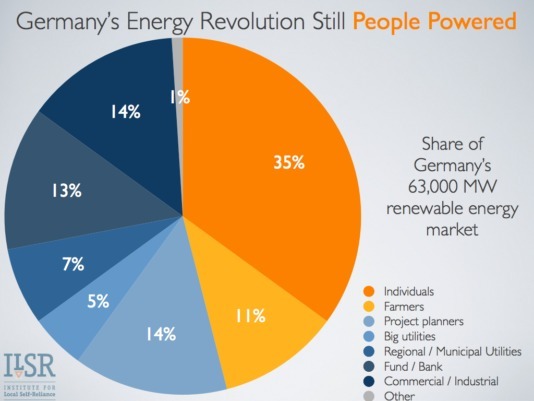 The real secret to this German success is attributed to the process of democratizing energy. Half of their renewable power is owned by ordinary Germans. That’s because of the feed-in tariff program that makes it ridiculously simple and safe for someone to park their money in solar panels on their roof instead of making pennies in interest at the bank. And during this amazing process, more than 300,000 new jobs have been created in the German economy. Another reason for this success is simply the price. The Federal Solar Industry Association (BSW-Solar) has reported that the average German solar system price in the second quarter of 2012 was estimated at €1.776 per watt peak, or $2.24 per watt peak at current exchange rates. Compare that to the US, where the average price per watt of an installed solar system was about $4.44, and you can understand why the U.S. is far behind with its 0.764 TWh record for May 2013. In terms of total solar power capacity per capita, Germany once again crushes every other country. At the end of 2012, it had approximately 400 MW of solar power capacity per million people, considerably more than #2 Italy at 267 MW per million people, #3 Belgium at 254 MW per million people, #4 Czech Republic at 204 MW per million, and #5 Greece at 143 MW per million people. The US came it at #20 with about 25 MW per million people. The German case shows that even grey skies can have a sunny horizon. It seems that questions like When will solar be cheap enough? Have already been answered.